Bottle Buddies offer the attractive crackling and crunching sound of a bottle plus a squeaking bottle cap! 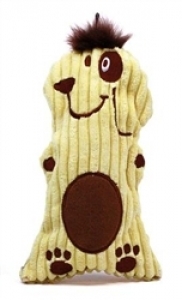 The durable plush outside with a crunchy water bottle inside make for a safer chew toy. Their special sleeve and reinforced inner liner encase the bottle, preventing sharp, dangerous edges. A velcro closure makes replacing used water bottles fast and easy, extending the life and novelty of this toy. Remember to put the original bottle cap onto each replacement bottle to keep your Bottle Buddy squeaking!